Got the gas cylinder lock and screw from Ron today, man pard am i happy with what you sent brand new parkarized and the screw is the old style to boot. Can`t thank ya enough buddy that really dressed it up. You're very welcome Pard. It was a leftover from rescuing the drill rifle just laying in a tool box drawer. Thanks again Ron they are great parts. Pm sent Paladin, thanks much. 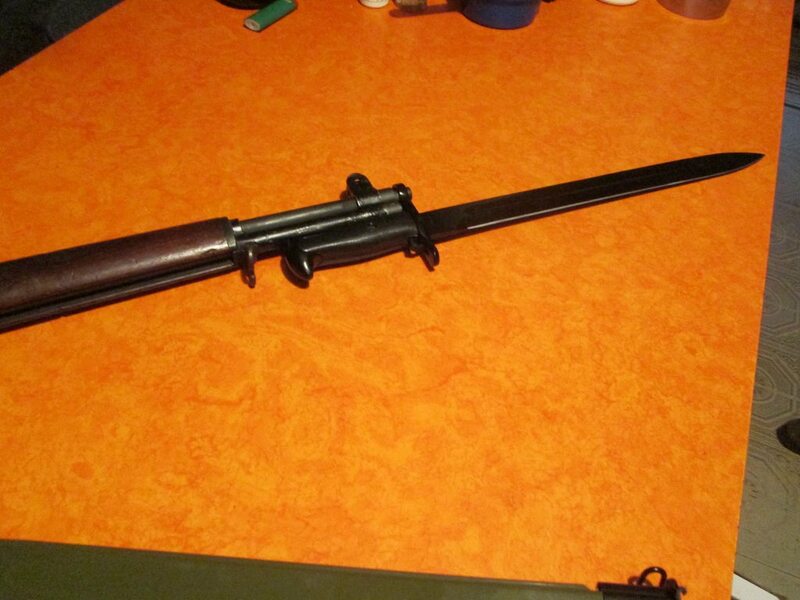 Got the repo bayonet today, i have to say it is really nice. Cool buddy! My son got one of those for his a while back. Neato Pitchy.....that's the long bladed one. I don't follow military guns religiously but "I think" the long bladed ones were Geneva convention outlawed. Mine is from the 50's and the blade is much shorter. 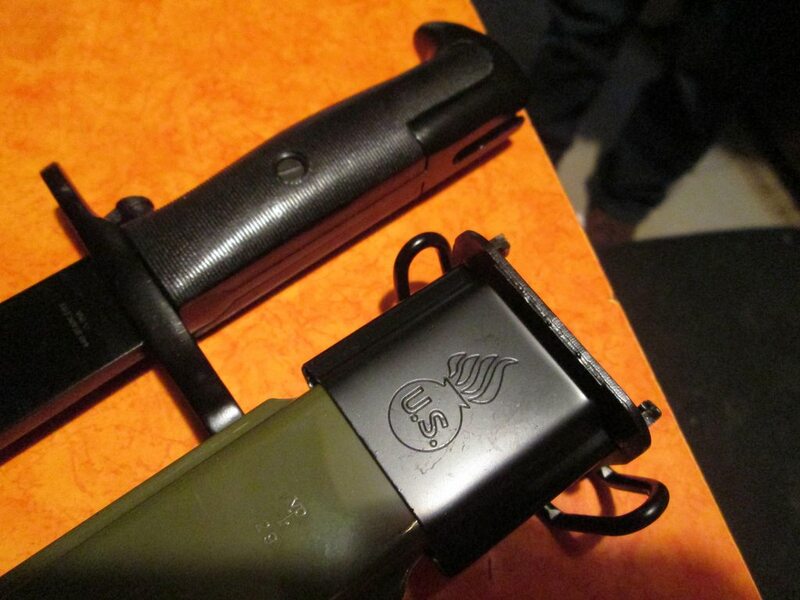 I believe the long bayonet was the WW1 model for the 03. A lot of the long ones were cut down to the new length for the M1. I believe this is the case. They used the longer ones on the M1 early in WW2, I'm pretty sure. No way would my buddy Pitchy run me through. Even if I was wearing my buffalo coat. 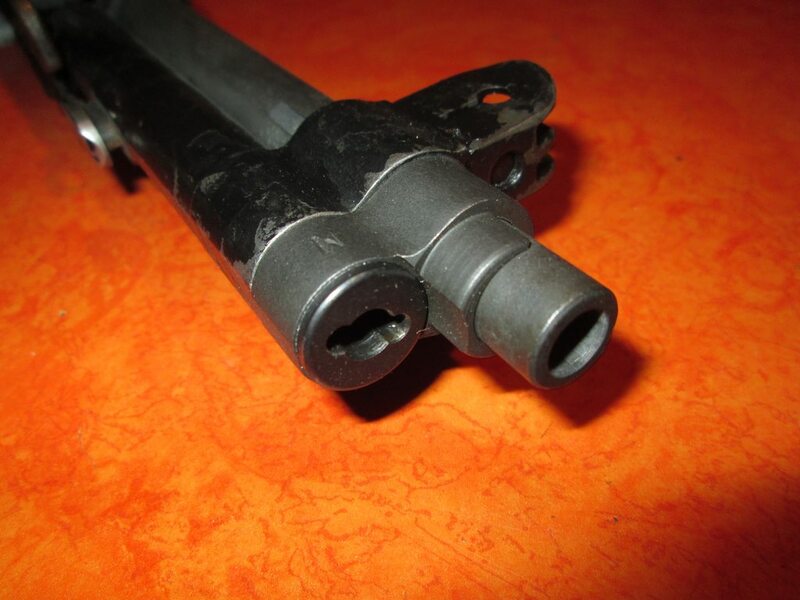 Nice bayonets Six, they made the 16 inch then shortened them to 10 later and i think even shorter at the end. Yours are original i take it the one i got for 35 is a repo, a original 16 inch cost much more. Here`s a old movie i watched yesterday that they are wearing long bayonets and some good shots of the Garand. The long bayonets look like they would of been in the way more than of usefulness. I've heard the weight of the long ones had an effect on POA/POI also. Makes sense, I guess. Was some interesting vids about the changes in bayonets on Matt Eastons Scholagladiatoria channel on youtube. His conclusion was that shorter blades were generally easier to use as fighting knives, which was one reason they became shorter over time, besides the unwieldiness of a long blade attached to the end of a rifle in trenches and close quarters. Hes also got tons of interesting scholarly info about swords and old weapons of all sorts on his channel, as well as the use of them, which he teaches along with his wife in England. Not sport fencing, but old school sword fighting with many types of swords covered in various ways. Thanks some interesting video`s on his site. 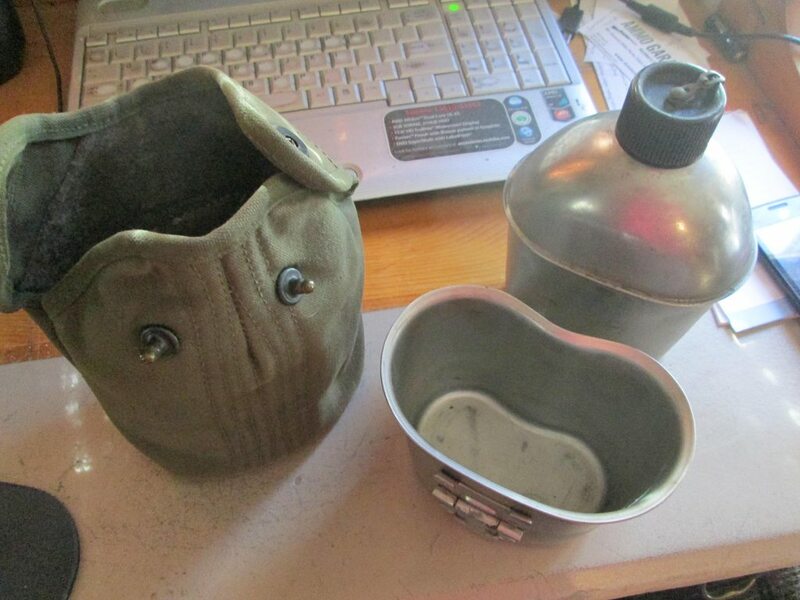 I`m getting there, nice 1944 canteen came today and helmet coming next week. Cool buddy! I have a couple of those old canteens around somewhere. I have a pretty good helmet, too. 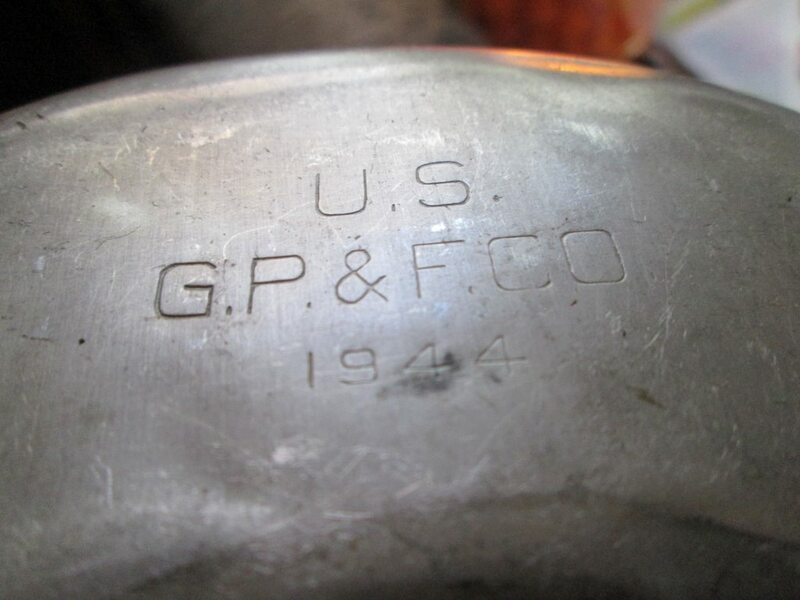 I also have a real nice German helmet. Thanks Jay, i pulled my old field jacket out of the closet but for some reason it won`t fit. I bet it shrunk, buddy. Lousy low bid contractors! Haha! That's a good idea, Bud. We will meet at your place and I'll give it to him. How much were the Garands selling for Todd. I need a fur coat in the temps we`re having, 20-30`s for lows. After buying the one i got i don`t have any money left anyway and mine is pretty original which is nice, thanks bud. well we are open to gifts bud. Well, I'll be the first to comment before that hombre from Maine chimes in with more sweet talk. After I get back from Home Depot we will start roll call and in the meantime you guys can figure out where you want to fall in. Now that there is one of those high speed low drag operators, right there! Usually they blur out the face of those guys so we must be in the loop! That's a real Bad Azz! Oooh, ooooh, I'm callin OPFOR (opposition forces) guy. Gonna throw together a pic! Well there! Oldest boy musta took his Mauser home. Can't he see I needed it? So I had to improvise and had Fritz using a captured M1 Carbine. I read somewhere the Germans liked them. Man! I look just like one of those "Aryan Superman" propaganda posters from during the war. Well, maybe a Volksturm latrine cleaner. Just hold on tight you guys....after the Home Depot visit the wife dragged me to get something to eat and I'm runnng late. I told her in the Jeep....,"eat out????? 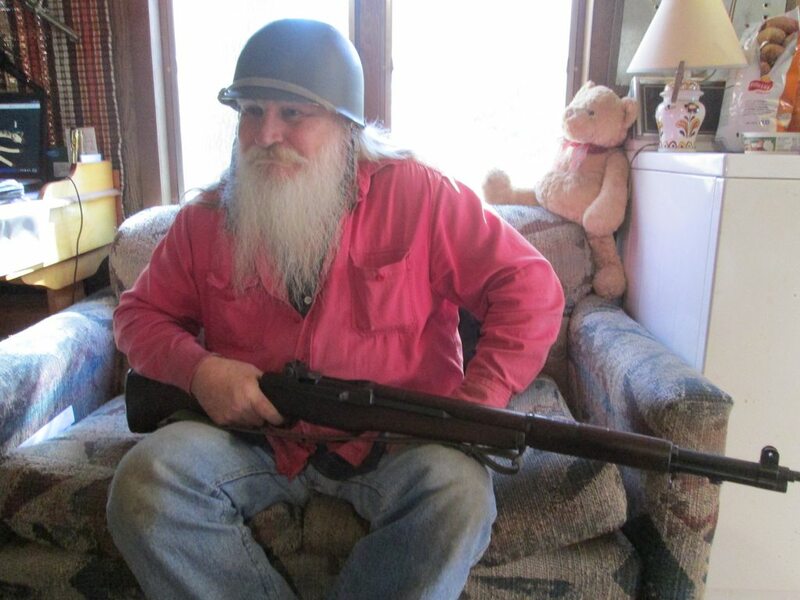 We have plenty of dog food, horse feed and some canned beans at the house....the guys are waiting for me on Leverguns!" I can't take too long talking. The stealth Blackhawk helicopter just landed out back.....headed to the inner city. Hey! Thats a good look for you, Jack! Haha yeah, I see how it is, now! Now you just claim stuff you see in my pics! I will have to take my pics in the kitchen now! You can claim that stuff but then you gotta scuffle with Kristy. Dude! You wanna be careful there! She's a BA. Haha yeah it is. It's a Lufwaffe dress dagger. The other is actually a medics tool. The end is squared a little. One side of the blade has really nasty saw teeth for cutting wood for splints. The other side is sharp. I have some other German stuff, too. Some of my relatives got it while touring Europe in the 40s. Jay...I've handled some of those Nazi knives where the back is a saw blade.....those babies will cut through about anything. Never saw anything modern that's as good and these old knives/saws are 75 years old. Yeah, where's Pitchy? I bet he dug a foxhole out by the sawmill, got tired cause the ground is froze, and fell asleep in it. We will have to leave him till morning, cause I ain't sneaking up on him with that M1. I seen the targets! Naw Trumpster called me and i had to take a quick flight out too the white house and stand guard there were some flakes roaming around the halls causing trouble and of coarse i had to remiss with Mrs Trump for a while. Got that all settled down and i just got home and had a quick breakfast but i`ll skip sleeping so i can stand guard around here . Six great picture ya look as crazy as me. Well at least we know everything was in good hands, buddy. He must have slept sound last night! Keep a sharp eye out today, Pitchy. Never know what could happen. That "Mad Jack" hombre could be coming for your M1.........or maybe that sweet Colt .44! Protect it all all cost! I think your right buddy he has a lot of stuff hanging on those walls, i think maybe he`s the one with the coat with big pockets. Mmmmmm....got out of bed at noon today to the door knocking......or I'd still be in bed....it's now 2:30.........an old co worker buddy stopped over. We swapped lies for a couple of hours.......had a hard time falling asleep last night, laughing in my sleep due to these posts and Pitchy sitting in a foxhole with the M-1 and then patrolling the White House hanging out with Mrs. Trump. Hey Six! Your buddies in the stealth Blackhawk just flew over about 150' up, headed SW of me... might be they are trying to sneak up on ya! Well Six i`m whoosing out today to cold and windy, was going to take another picture or two but maybe tomorrow. 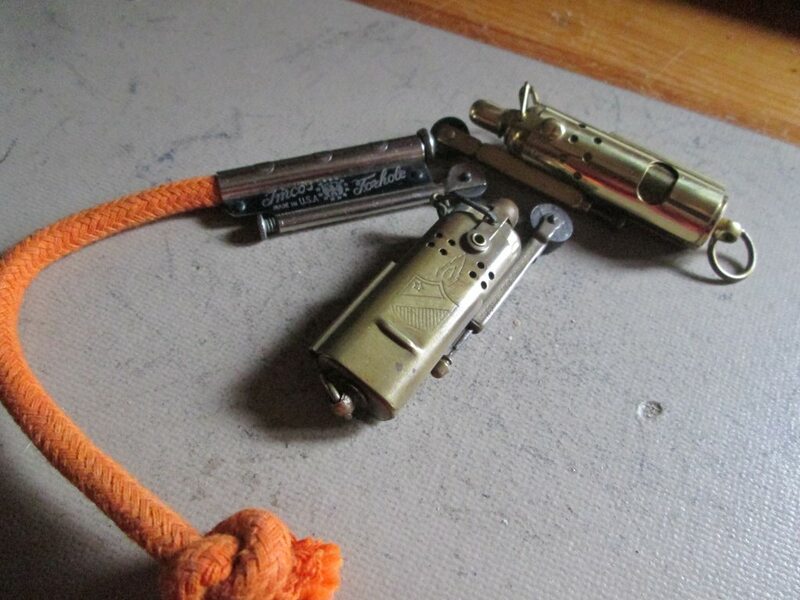 Do have a pic of a couple fox hole lighters. Dang Pitchy....I'm still wearing shorts....65 and sunny out there. ......I'm still trying to get the motivation to split wood.....I fed the horse and came back in......phuck it......gimme a beer......wish I could but gotta keep it outta the house. Video about the fox hole lighters.